The French word 'Frisson' means a sudden and strong feeling of excitement, which is a pretty good goal for a great wine. The sample I tasted expressed an elegance and softness normally found in well-aged reds from the world's best growing regions. Less fruit-forward and tannic than today's typical Napa Cab, this wine showcases Cabernet's delightful and nuanced complexities. Drink now through 2024. 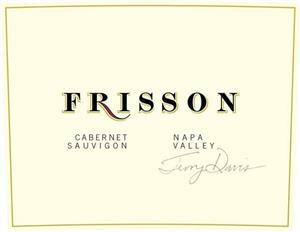 Texas Businessman Terry Davis is the owner of Frisson, an investment he made after sitting next to a winemaker at a Cystic Fibrosis fund raising gala. The following day, Terry got a call offering him three tons of Diamond Mountain cabernet. He orgranized investors, hired a winemaker, and the rest is history - what started out as a desire to fund research into the disease that had afflicted his son became a new business venture. A portion of the proceeds from every bottle sold goes towards Cystic Fibrosis research. And the story has a happy ending - Terry's son now has two of his own!